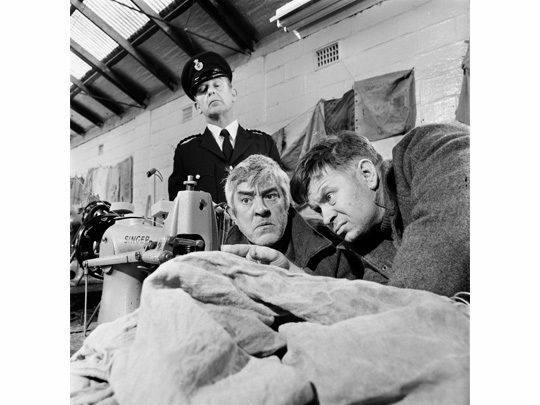 (From left to right) Actors Jeremy Stephens, Ian Mune and Ilona Rodgers in 1975 drama The Woman at the Store. 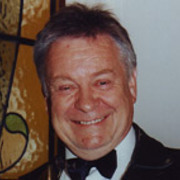 A behind the scenes shot taken during the filming of Winners & Losers episode Shining with the Shiner. From left to right, director Roger Donaldson, director/actor Ian Mune, sound recordist Craig McLeod, and cinematographer David Gribble. 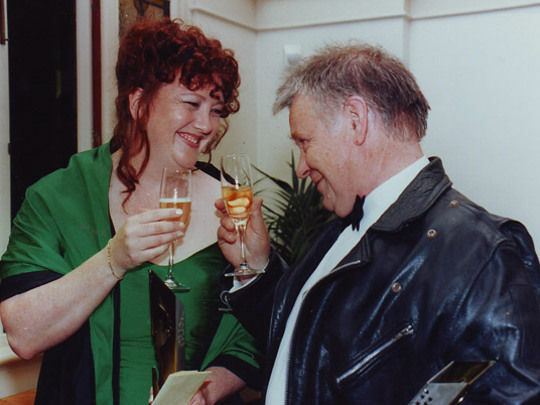 Geraldine Brophy and Ian Mune celebrate having won Best Actor and Best Actress for Home Movie in the 1998 New Zealand Film and Television Awards. 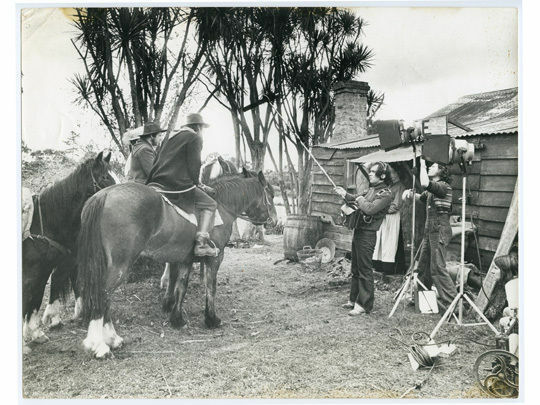 A behind the scenes photo taken in the Waitakeres in 1974, for The Woman at the Store. 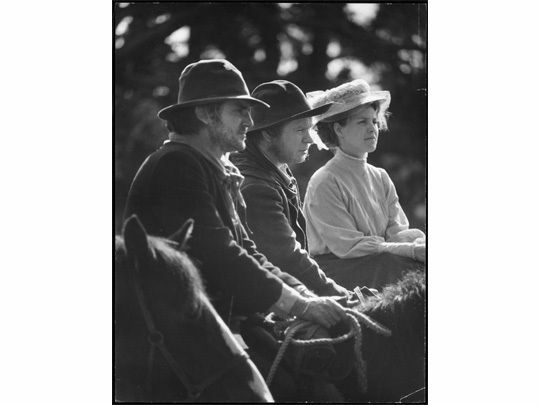 On horseback are actors Ilona Rodgers (obscured), Ian Mune and Jeremy Stephens. 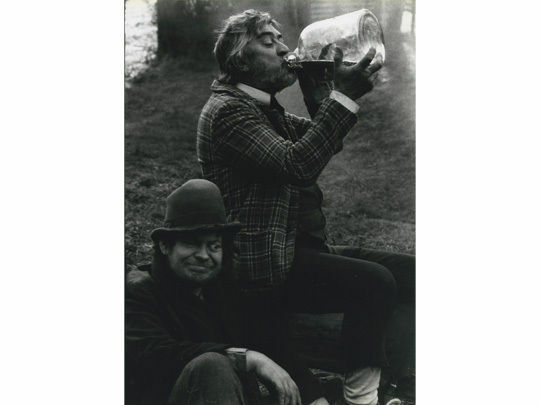 The Shiner (Ivan Beavis) takes a swig; the Honourable McKay keeps an eye out. 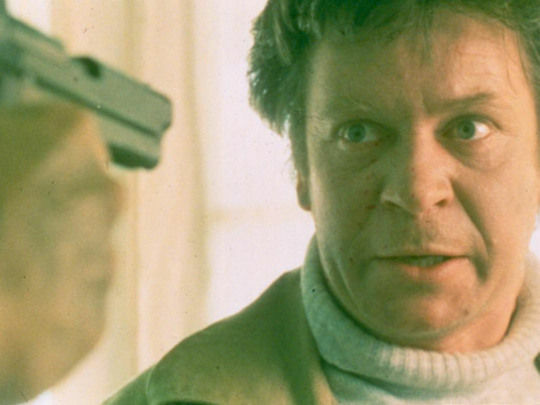 From the Shining with the Shiner episode of 1976 series Winners & Losers. 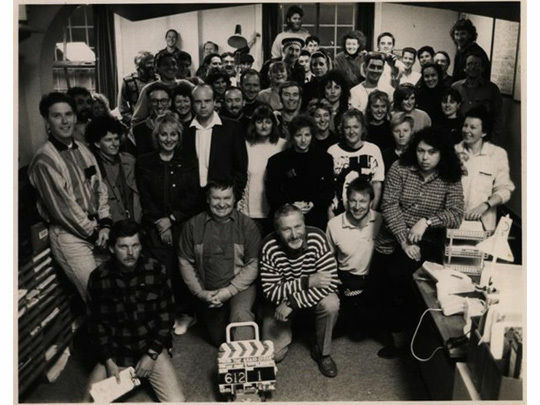 Some of the cast and crew on 1988 TV movie The Grasscutter. Director Ian Mune is smiling behind the clapper board. 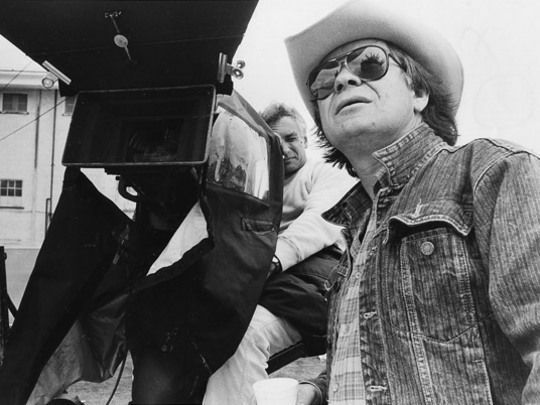 Actor Marshall Napier stands behind Mune, in white shirt and dark jacket. Wearing the dark swanndri on Mune's left is director of photography Matt Bowkett. On Mune's right, producer Tom Finlayson kneels in the stripped shirt. 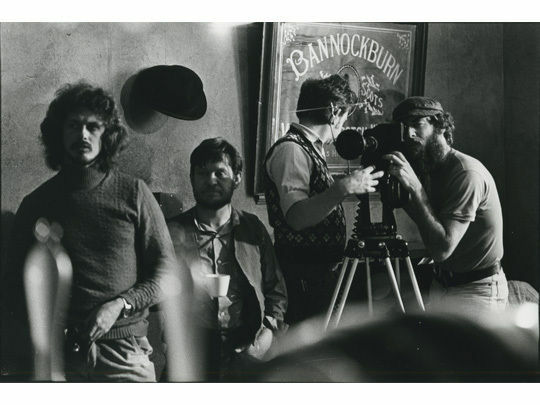 Paul Leach behind a Panaflex camera, alongside director Ian Mune; from the set of Came a Hot Friday. 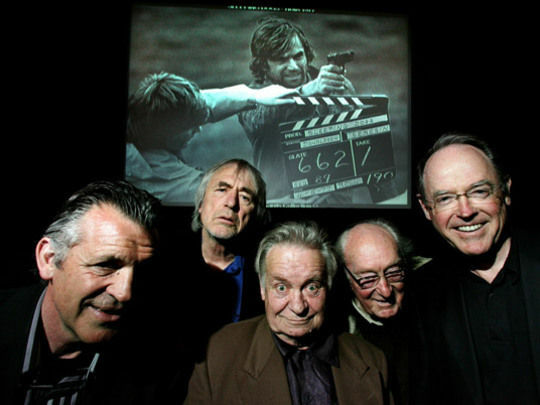 A 30th anniversary reunion for movie Sleeping Dogs: from left to right, associate producer Larry Parr, special effects man Geoff Murphy, actor/co-writer Ian Mune, actor Bernard Kearns, and Don Brash (who helped finance the film). Ian Mune in a scene from Sleeping Dogs. 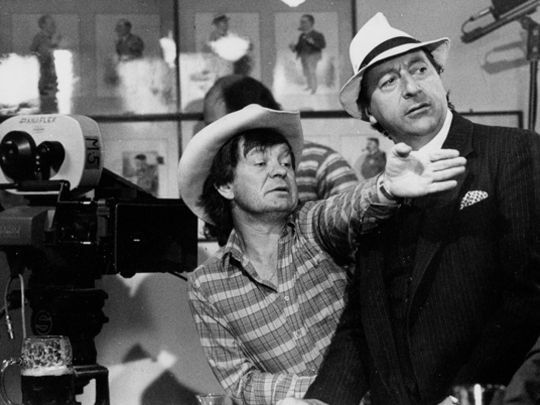 A publicity shot taken for Winners & Losers episode Shining with the Shiner: The Shiner (Ivan Beavis, in check jacket) and the Honourable Mackay (Ian Mune, with fake eye) surrounded by their fellow swaggers. 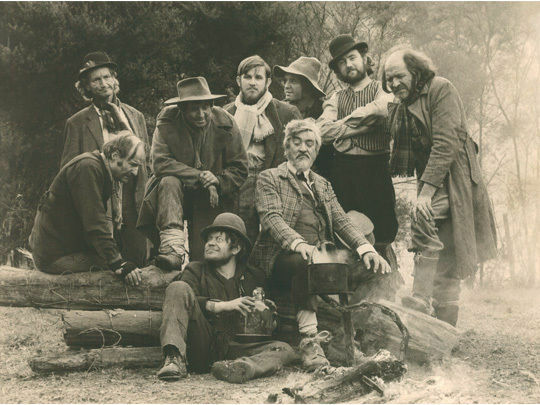 Actor Bernard Moody sits on the log at left, next to Harold Kissin, whose arm is resting on his leg.